This modern converter has a stylish design and offers two antenna RF inputs as well as HDMI and SPDIF outputs. The 500 GB onboard storage provides enough space for hundreds of hours of HD content. Big USB HDDs are not very convenient to connect to the device because of its USB ports arrangement. 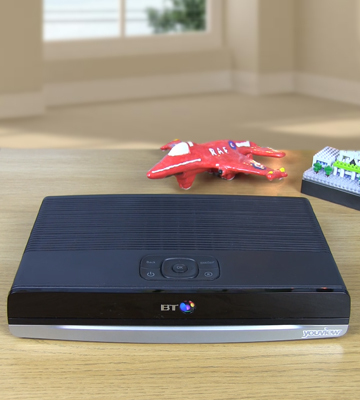 The HDR-1100S set-top box provides a great Freesat+ experience owing to the support of such advanced features as EPG and Freetime Showcase. 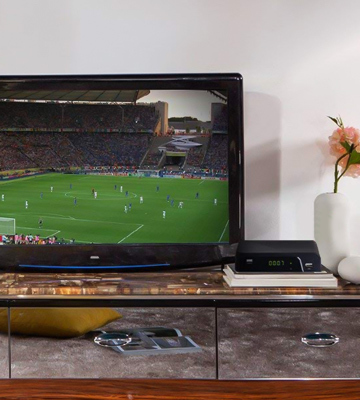 Rich connectivity allows using the device as a media player with analogue and digital TVs. 7-day catch-up TV allows for recording your favourite shows from a week ago right from the programme guide. Additionally, the huge on-demand library has one of the biggest selections of content that will be suitable for any taste. The device comes without aerial cable. BT YouView+ Set Top Box will easily turn your regular flat TV into a real Smart device without any subscriptions or satellite dishes. 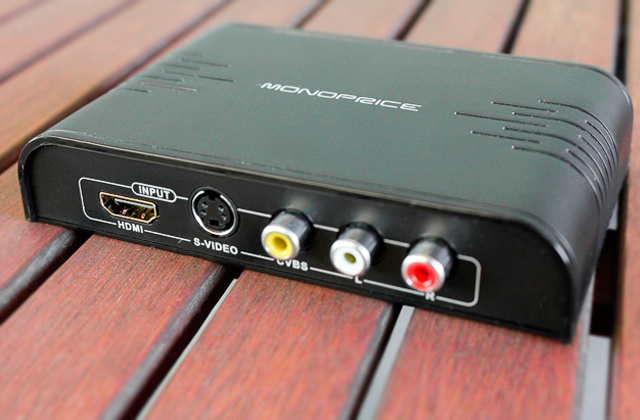 The device will allow you to not only watch full HD content but also control and record it without hassle. Moreover, all that is possible to do via a mobile app. The Sky TV subscription allows for watching over 70 channels in true Full HD. On top of that, you will have a free access to the Internet television services such as Catch Up TV, Sky Box Sets, Sky Cinema, and Sky Store. The device comes without the user manual. 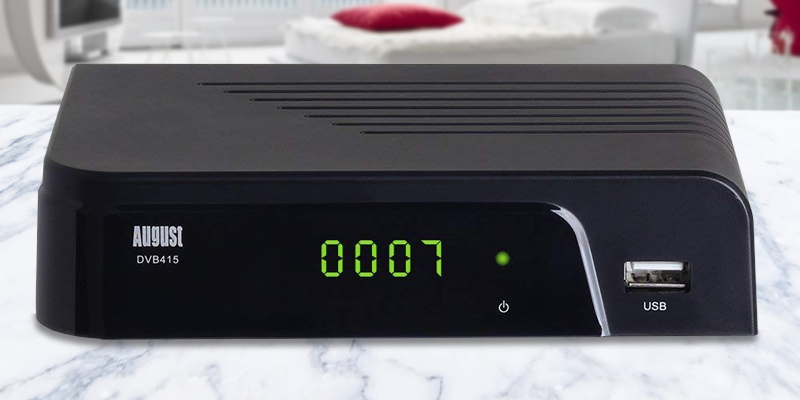 A stylish and portable Sky DRX890 DVR recorder connected through a TV aerial antenna allows recording and watching your favourite shows at any given time. The recording capacity offers up to 125 hours of recording in HD quality. With the TM-5402, you will be able to record two shows from different channels while watching a third channel at the same time. The user interface design is somewhat outdated. 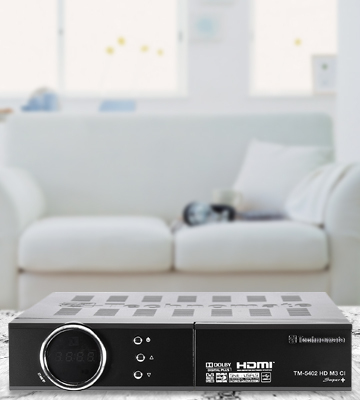 With Technomate TM-5402 in your house, you will be able to save up to 10 000 Full HD satellite channels as well as experience the best shows in Dolby Digital Plus surround sound. Moreover, the device is quite easy to set up and has a special Eco-friendly mode that allows saving up energy by consuming only 1W per hour. This model comes with an HDMI cable in the package. That's why you can use the box with displays and monitors that support HDMI right after unpacking it. May not always find the channels, which are found by a built-in TV tuner. You can breathe a new life into your old TV with the August DVB415 DTV device. Using this converter allows you not only to watch high-quality Freeview broadcast but play videos, audio files and view photos from a USB stick. 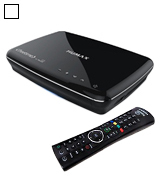 The Humax HDR-1100S Wi-Fi DVR has a stylish black plastic case with curved edges and glossy plastic top. 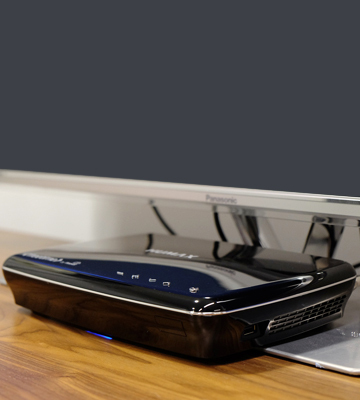 With its sleek and modern design, this model resembles more a gaming console than a conventional TV converter box. The glossy top surface of the device carries only the volume adjustment “+” and “-“ control buttons, two scrolling controls made as stylish up and down arrows and the power button. All the buttons are convenient to push protruding from the flat surface of the TV converter and provide the basic control functions. 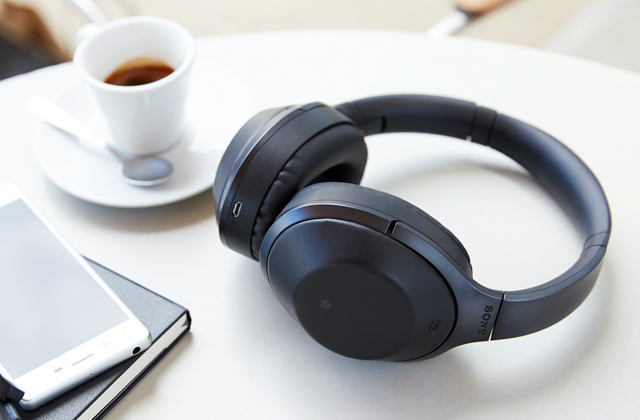 To the HDR-1100S' credit, it was designed not only to look stylish but also to be ergonomic and offer wide connectivity possibilities. In this regard, the set of ports placed on the model back panel will cater for the needs of a wide audience. 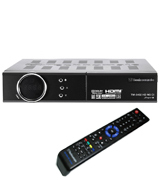 This HD converter box has two RF in ports for you to switch between the DTV providers/sources, separate left and right-channel analogue audio outs grouped with the composite video out and the SPDIF optical audio out. To the right, there is not so often seen in such devices Ethernet port and the USB port just below, which are followed by the HDMI port. 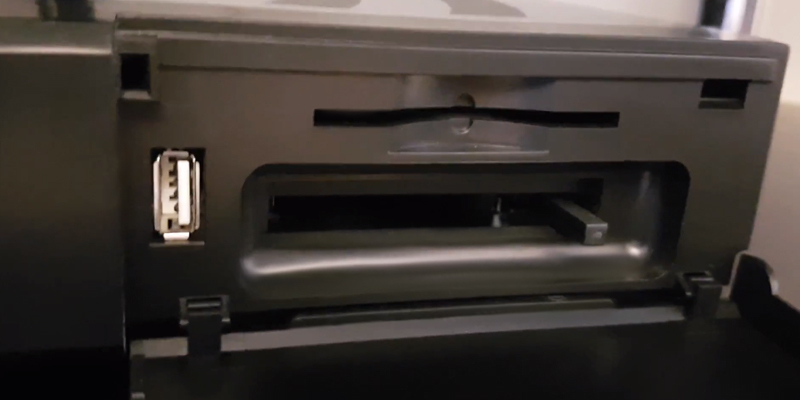 The second USB port is located near the right corner on the front panel. Using this digital-to-analogue converter offers not only a TV-immersive experience but also an opportunity to feel yourself inside a time machine. It is all owing to the Freetime guide support, which as if takes you forward (8 days) or backward (7 days) in time allowing you to seamlessly select and watch the content broadcast within this two-week-long period. 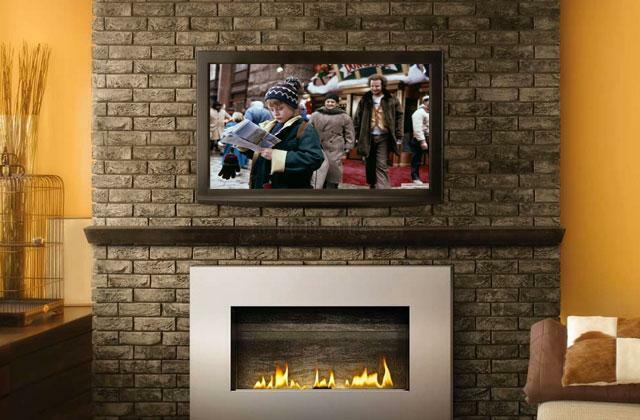 The easy roll-back feature makes the TV programmes on the players supported by the HDR-1100S to be instantly available for watching so you do not need to exit the guide menu. With that, you are free to view your favourite content using the ITV Player, BBC iPlayer, All 4, YouTube, Demand 5, Hopster and Curzon Home Cinema. What is even more exciting you can use the Showcase feature that shows you editorially selected programmes for the day selected to always keep you updated on the latest must-see shows and movies on TV. The support of such advanced features as Showcase and TV Guide is complemented with the availability of half terabyte built-in storage on the device. You can record and store dozens of hours of video and even more audio on this 500 GB HDD to watch and listen to it any time you want both on digital (using the SPDIF and HDMI outs) and analogue devices (using the pair of analogue audio outs and the composite video). The wired Ethernet and wireless Wi-Fi connectivity allow you to keep your media collection stored on the device always up to date as well as to share your content with other devices connected to your home network. While other companies are trying to boost the users’ experience by expanding the internal storage of their devices and adding more and more bells and whistles, the BT just improves the existing features. 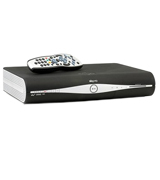 With that in mind, the Youview+ 77328 gets the job of recording HDTV videos done efficiently and without a hassle. The device features a 500GB internal hard drive, which allows for recording up to 150 hours of HD content right from the TV broadcasts; alternatively, you will be able to record up to 300 hours of your favourite TV shows in standard definition (480p). Additionally, you can connect external hard drives as well as USB sticks with high capacity to increase the allocated space for recording even more. 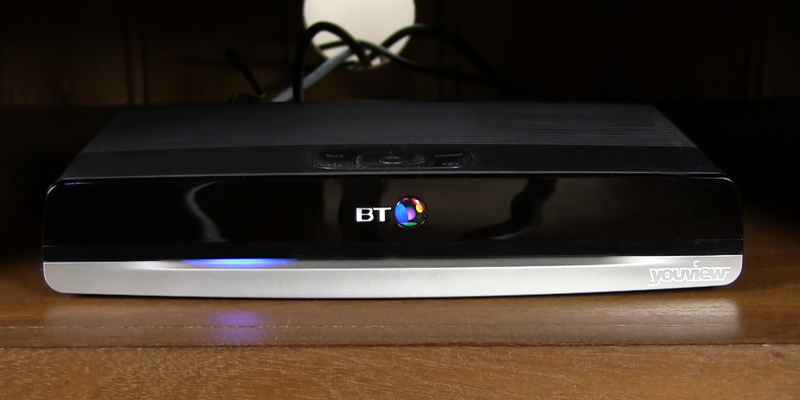 Unlike models from competitors, the BT Youview doesn’t have any hidden monthly fees. In case you have already subscribed to any existing TV contracts, you can get the access to the Home Hub router by paying a small monthly cost. Otherwise, you are getting the device that completely frees you from any TV subscriptions, moreover, you won’t even need a satellite dish. The great simplicity of the design allows you to use this handy DVR with just a simple aerial antenna and a broadband connection. Speaking of internet connection, you will need it in order to set up the device. Since this model doesn’t have a Wi-Fi support, you will have to connect it to the existing internet cable. After that is done, you are free to use all the amazing features this little box has inside. 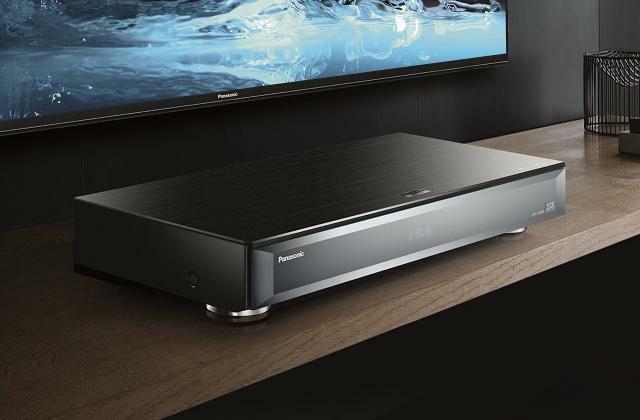 What is interesting about this model is that it supports a special YouView+ mobile application that offers you an exceptional freedom of choice when it comes to setting the TV shows on record via your smartphone. 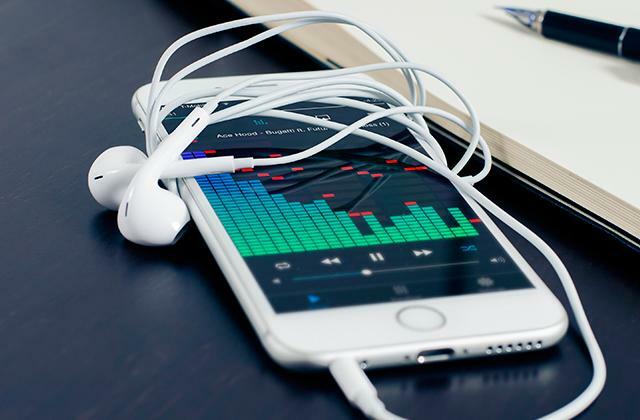 An easy-to-use, comprehensible user interface of the mobile app allows you to set up the recording schedule in just a few taps. 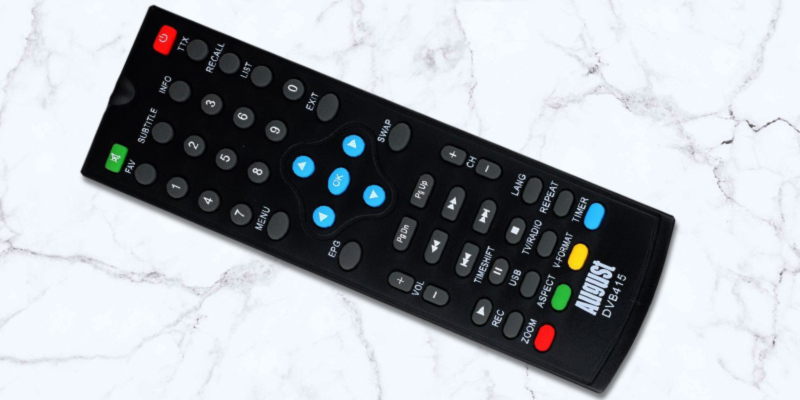 As for the native YouView+ app pre-installed to the box itself, you can quickly open it by pressing a single button on the remote controller that comes supplied with the device. Likewise, you can use the search feature to catch the shows you may have missed. On top of that, the remote control allows you to quickly switch from HD to SD and back in case the channel supports HD streaming. The randomly allocated memory of the device allows you to dig through all the programmes that have been on-air for up to 7 days back, which will be convenient for those who want to watch all the interesting stuff they've missed in one session. 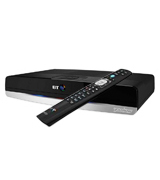 In case you are searching for a reliable device which can be used by any member of your family, look no further, the BT Youview+ 77328 is the pick for you. During the last few years, the sky company has been putting up more and more new, upgraded models of their DVR systems and the DRX890 is no exception when it comes to improvements. Although there are models with bigger internal storage capacity and Wi-Fi support available on the market, there is no real need for them if you do not intend to store a month worth of TV shows. With that in mind, this particular device has an internal storage capacity of 500GB, which should be more than enough to save approximately 125 hours of HD content. In case you want a bigger HDD you may consider purchasing a 1TB or 2TB models that are optionally available, although are significantly pricey. Additionally, this DVR recorder has a USB port that you can use as the additional storage solution in case the internal drive of the box has run out of space. The only drawback of the package is that the device doesn’t come supplied with the user’s manual or any sort of setup instructions. In case you are not a technician you may have a hard time setting the sky box up. In order to do that you may either call the sky tech support for help or visit their website to download the user’s guide. Since the device comes with the TV tuner card that is not set up, you will have to pair the one you have with the device. In order to do that you will need a stable internet connection. It should be strong enough for the firmware to update to the current version and have at least 512 kbps, however, a simple broadband cable will be more than enough. 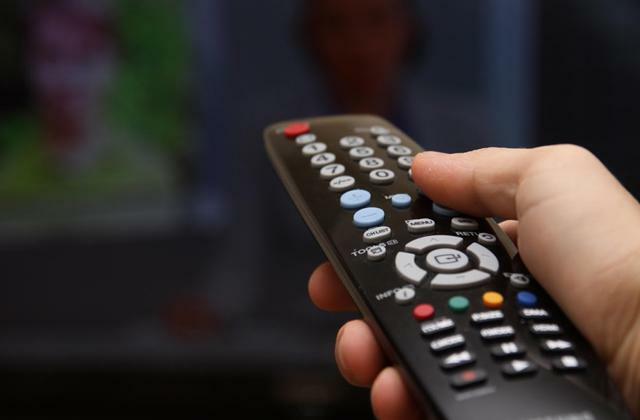 Depending on your TV service subscription plan, you will be able to watch and record up to 70 different channels from the sky network as well as from other similar companies such as BT or Freeview in true high-definition. 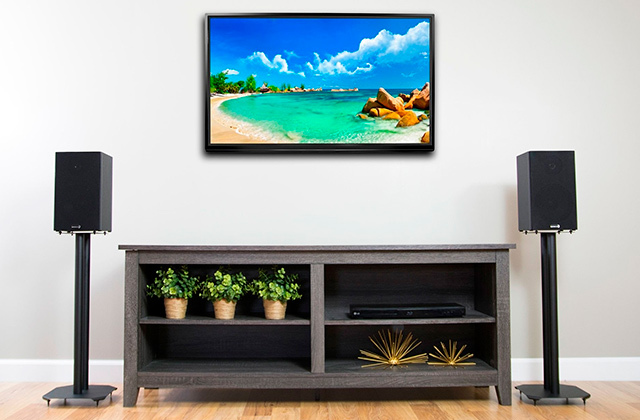 In the same way, you can turn your regular flat TV into a smart device using the HDMI cable, which allows for using all of your favourite streaming services: Netflix, Amazon Prime Video, Now TV, and others (as long as you have an internet connection up and running). As for the analogue capabilities of the device, it features two aerial radio frequency outputs that are able to catch a TV signal and easily decode it into a high-definition image no matter how harsh the weather outside is. 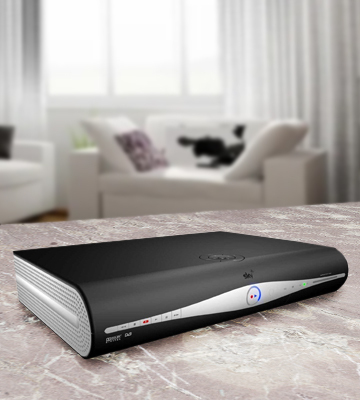 All in all, if you are looking for a simple device that allows you to watch and record your favourite TV programmes and shows and you don’t want any unnecessary gadgetry, this DVR with a digital tuner from sky is a solid choice for you. 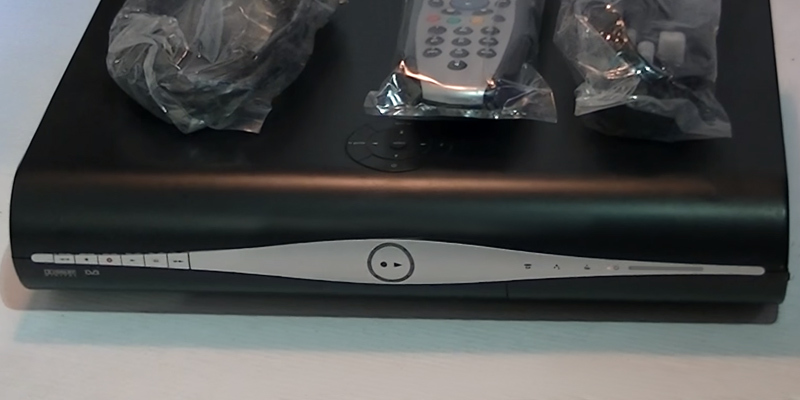 The Technomate TM-5402 is a feature-rich DVR that allows recording content from both satellite and TV signals, which is quite nice for such a modestly priced device. 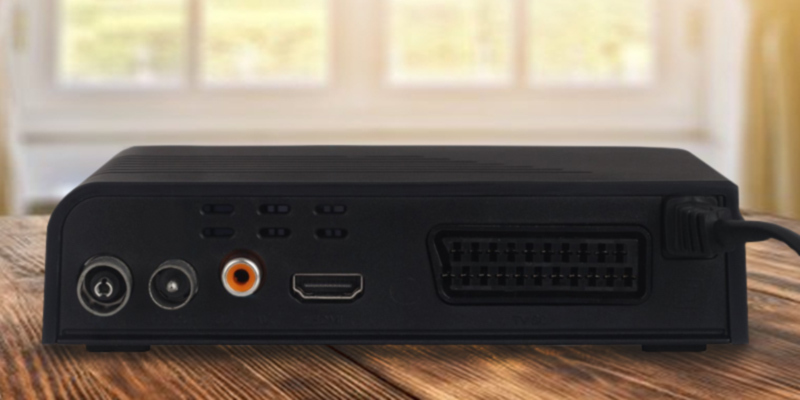 Some customers may find that the user interface of the DVR is somewhat dull and unintuitive, however, it doesn’t really matter, since the device works flawlessly when it comes to recording video in Full HD. Unfortunately, the TM-5402 doesn’t have an internal hard drive, which is a bummer, to say the least. In order to record any of your favourite channels, you will have to either purchase an external HDD or use the USB sticks and transfer the data to your computer or a laptop. On the bright side, however, the built-in satellite receiver is capable of storing up to 10,000 satellite channels, which makes this model a great choice in case you don’t have a separate one. This model is one of the few that are able to actually record one channel while you are watching another, which is extremely convenient in case you have a family member who wants to record a football match and you want to watch the news, for example. 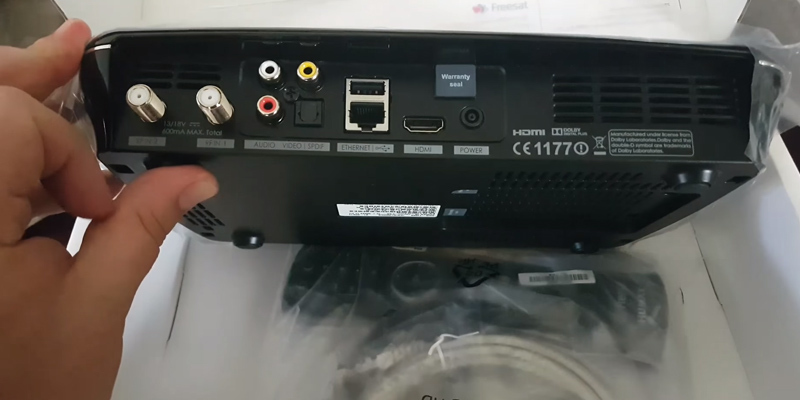 On top of that, this DVR player features an RF modulator that allows for connecting multiple TVs so you can watch several channels simultaneously in different rooms. Likewise, the device also allows for scheduling the recording sessions. This way, you can set up the channel and the time when you want to record a particular show and the device will do the job while you are away. In order to record in advance, you will have to make sure that the device is properly configured. Specifically, you will have to manually set the system time of the device so it matches the time of the scheduled programmes. Otherwise, the recorder would not be able to catch up with the schedule of the shows. Alternatively, if the time is set correctly, you can pause the broadcast for 30 minutes and continue watching it at any given time. The addition of the Ethernet port to the current version to the Technomate flagman model opened an opportunity to use various services that were inaccessible just a few years ago. That said, by connecting the Ethernet cable to the device you will be able to freely browse the Internet, check the weather, and even watch YouTube videos. All you need is a fast Internet connection (at least 1 Mbps). 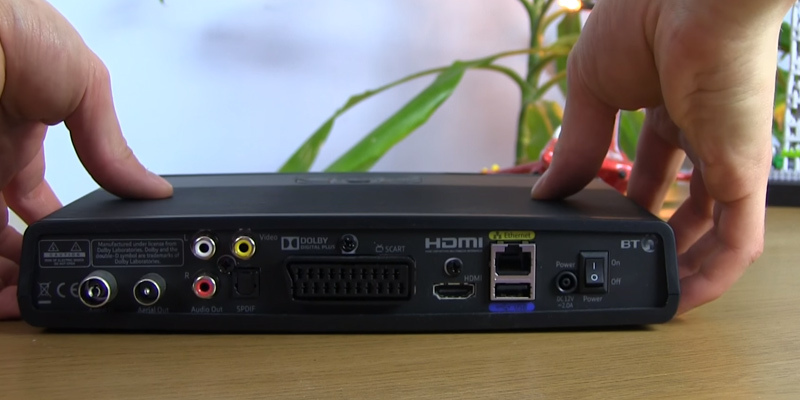 The TM-5402 from Technomate is one of the best DVR players in its price range. Thanks to its versatility, it can be used for both receiving and recording all of your shows you would have missed otherwise. The August DVB415 is one of the solutions that make TV and data transfer technologies advancement a welcome rather than annoying and imposing thing. 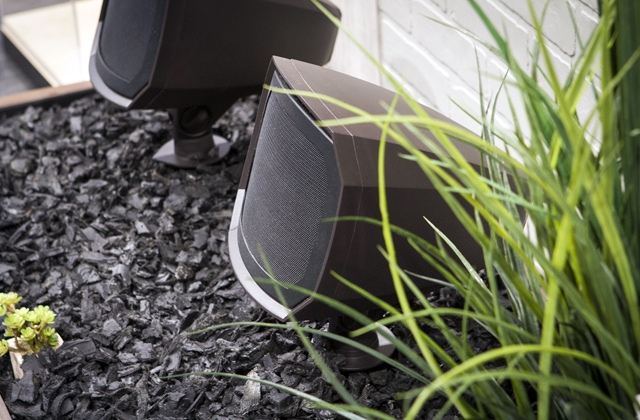 With its sleek design and a compact black case with curved angles, the DVB415 model has a surprising versatility. Its primary function enables a conversion of a digital signal received from the antenna input to an analogue one with its output over the SCART port and providing composite video (CVBS) and RGB video out options. 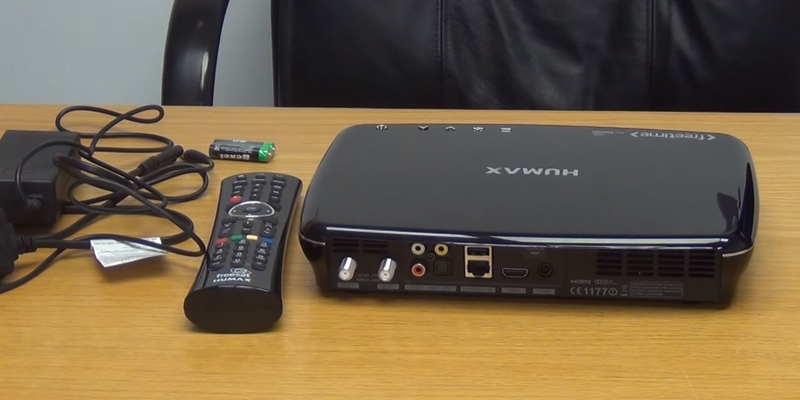 In addition to the analogue video/audio SCART port, which allows outputting 576i and 576p composite video in a standard configuration the DTV converter box by August offers a digital HDMI output port with up to Full HD video resolution support. Together with 1080p and 1080i Full HD resolutions, the box supports their 720p and 720i HD counterparts, which is useful for pairing the device with HD monitors. 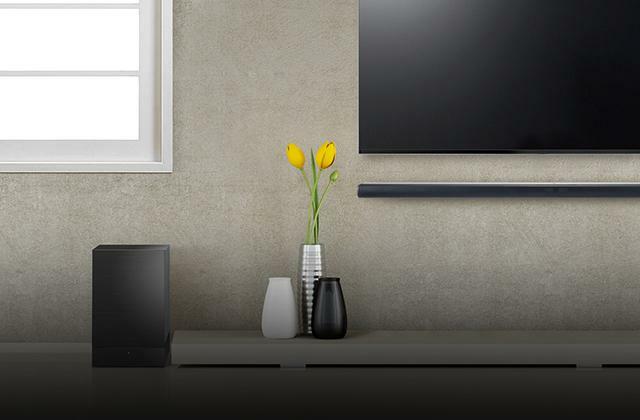 The coaxial digital audio out aptly completes the HDMI and SCART connectivity and allows you to connect compatible receivers or stereo systems with a digital input to enjoy a high-quality audio from a DTV broadcast or a connected media transferred with no data loss. The August DVB415 model not only provides a great connectivity and compatibility with a wide range of devices but also has a USB 2.0 port, in which you can plug USB sticks and USB HDDs of up to 1TB capacity. These external media can be used as a storage for video and audio content recorded from digital TV broadcast or other sources. 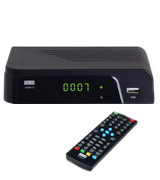 Thus, the DVB415 set-top box can be used both as standalone digital content recorder and player. The feature of recording to external media also makes it possible to set up an automatic recording schedule after listing through the 7-day EPG available so you can be sure you won’t miss your favourite shows. In addition, you can rewind and pause a live TV transmission owing to the TimeShift support. When choosing the DVB415 model by August you can rest assured that you are covered in terms of media formats supported by the device. This device is capable of working with such popular video formats as mpg, dat, mp4, mov, DivX, avi and commonly used mkv. On the audio side, the August converter supports mp3 and Ogg, which provides a superior quality. 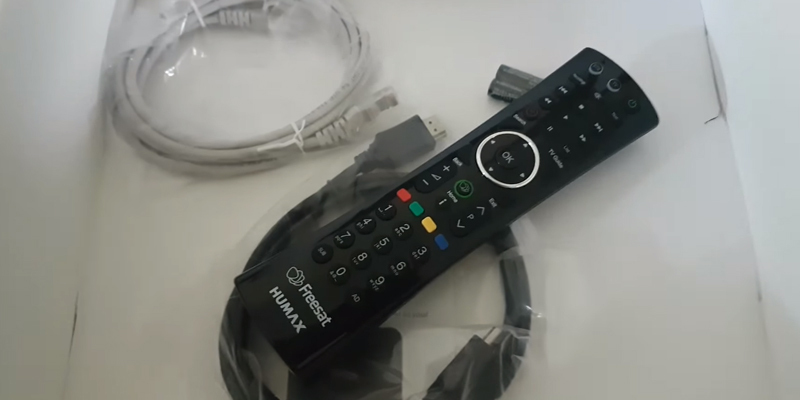 The bundled remote control makes accessing your media files on storage media connected as well as managing TV programmes an easy task. A DVR (short for Digital Video Recorder) is a device that allows you to record video from certain sources into a digital video format. They are most often used for recording television shows from broadcast or cable television to be watched later. These devices first appeared around the turn of the 21st century as standard video recorders meant to replace the recording capabilities of VCRs. However, in recent years many models have included a large number of extra capabilities, allowing them to be used in many different ways, such as like a set-top box, streaming media viewer, or program scheduler. At their core, most DVRs are essentially small but powerful computers that contain much of the same technology that is often found in a PC or even a smartphone. Many include internal storage in the form of a hard drive or flash memory, and some allow you to connect different forms of additional storage for storing the recorded video. Often, some sort of program scheduler is included that allows you to easily set it to record certain television shows automatically on a recurring basis. Many even include the ability to record more than one show simultaneously, although such capabilities may require the use of extra hardware. 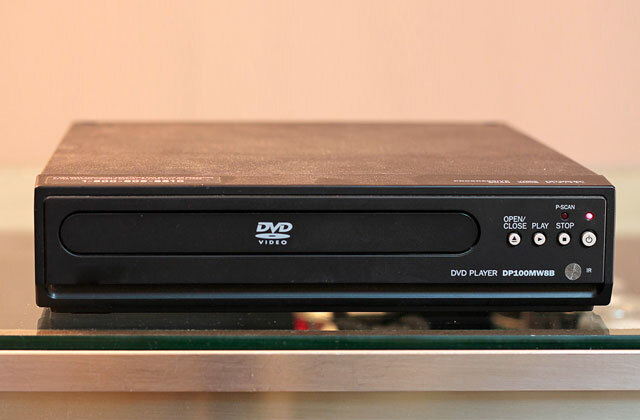 The very first DVRs that appeared on the market almost 20 years ago were pretty limited in their capabilities, offering little else than the ability to record shows either manually or through a program scheduler. Some other included features, such as the ability to share video or automatically skipped commercials, were removed thanks to legal action by several media companies. However, more recent models have included many of these features again, as well as adding many more. Finding the right DVR for your needs will come down to knowing which exact features you want in a device. Here are a few things to keep in mind while looking for the perfect DVR. Recording Capabilities - All DVRs at their core function as video recorders. However, not all of them offer the exact same features when it comes to recording video. Some are simply made as "live recording" devices without any automated input, whereas others include numerous features that allow you to enhance the recording experience and even edit video that has been recorded. Others may even include the capability to record video from more than one source at a time. When buying a DVR, it is best to check the exact recording capabilities of the device to make sure that they match exactly what you want. Internal Storage - Many DVRs come with some type of internal storage included. However, many recent low-cost models have appeared that do not, instead allowing you to connect your own external storage devices, such as external hard drives, SD card, and USB flash memory sticks. Even some models with internal storage may only supply a small amount, but also allow for external storage to be added. Basically, the more storage that is either included or that can be added, the better, but you should make sure that any DVR that you purchase includes some kind of internal storage if you don't already have or won't purchase your own to add. Extra Apps - Ever since the explosion of smartphones onto the market about 10 years ago, many devices now allow the installation of apps, or include their own. Many DVR models include apps now that allow you to use online services such as Youtube, Netfilx, Hulu, and others. If this is a capability that you desire, it is best to make sure before purchasing a device that the model you wish to purchase supports these functions. Other Features - With each passing year, DVRs have been released that have added more and more features to their standard feature set. Some more recent features include the ability to record from multiple sources simultaneously, included microphones that allow you to record your own commentary or other audio along with the recorded video, and many different sharing capabilities such as streaming recorded video. If you wish to use your DVR for purposes other than just recording the occasional television show, it's best to check the extra features that are included on the latest model to make sure they meet your expectations. DVRs have been around for a long time. Much longer than most people realize, in fact. The very first DVRs to hit the market were Microsoft's ReplayTV and the original TiVo model, both of which premiered in 1999. Back then, VCRs were still the most popular (and really the only) way to record anything broadcast on television. The DVR helped make the process of recording a television show quite simple, especially in comparison to a VCR. VCRs required a fair amount of manual programming to set up to record a show at a specific time, and this was often quite complicated and difficult to do as it all had to be done using the few buttons on the front of the device, with no on-screen menu to help with the process. DVRs, meanwhile, provided a simple on-screen menu which allowed you to not only record a show at a specific time, but browse through the listings, set an option to record each new episode of a particular television show, and overall a much easier to use and better experience. The only thing that kept them from being a staple in every person's living room at the time was the high price tag. During the early days of the DVR, both ReplayTV and TiVo competed for the crown. While ReplayTV met with some moderate success. TiVo gained the most attention, becoming popular enough with DVR enthusiasts to help make the brand a well-known name. For many years after their introduction, to "TiVo" something meant to record a show on a DVR. 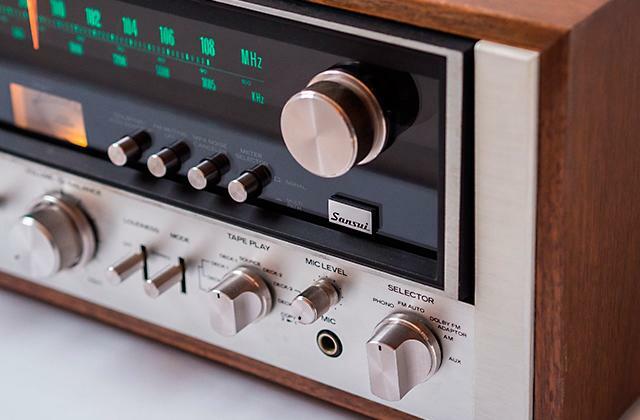 However, the high price tag of the early models still kept them out of many people's living rooms. While TiVo did meet with some success, they still were only in a small percentage of homes in the US. Their successes didn't go unnoticed by many of the big cable TV providers, who started working on DVR models of their own. TiVo also managed to attract the attention of many content providers, who didn't feel that it was legal for them to provide such features as commercial skipping, thus cutting into the revenue of many television networks. TiVo, along with several other DVR providers, soon removed such features in order to help appease the content providers, who were always vigilant about possible piracy. Meanwhile, many of the cable TV providers started releasing their own custom DVRs, often including them with cable subscription packages. While many of these DVRs had similar features to TiVo, many of them also lacked the intuitive interface that made TiVo DVRs so easy and pleasant to use. Despite this, the market soon became watered down with custom DVR models, each with its own set of features. TiVo, despite the setbacks they have suffered, are still around, and still provide excellent DVRs. 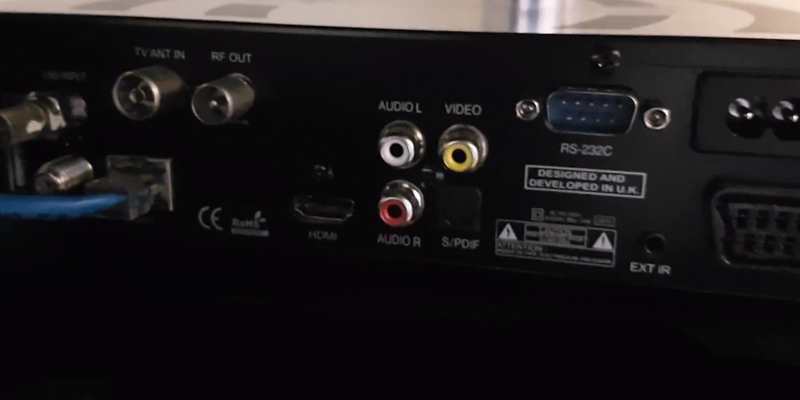 However, there are many other DVRs on the market, many of which provide features that most TiVo or cable company provided boxes do not, such as recording from different video inputs, clip editing, separate audio track recording, and many others. There is even software for the standard PC that allows you to turn your computer into a DVR. With all of the healthy competition available on the market now, today is definitely the right time to purchase your own DVR. Q: How do DVRs work? A: DVRs are basically very similar in terms of hardware to a standard computer. They use many of the same technologies as computers, but instead of running an operating system like Windows or MacOS, they have their own custom software that focuses on providing the services and features common to the devices. 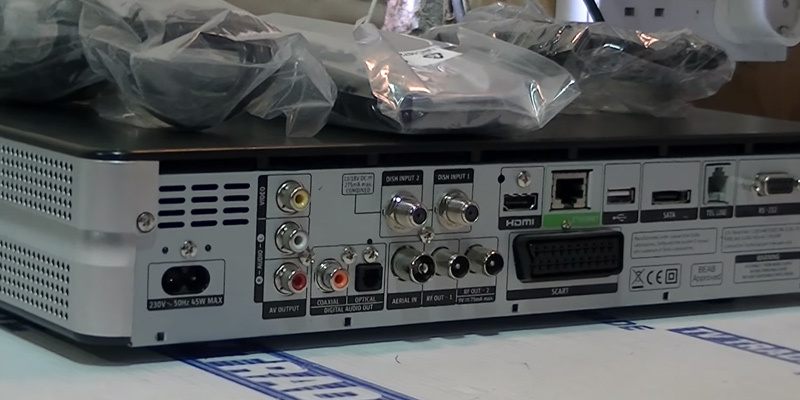 A DVR records video by taking the video output from another source, such as a cable box or TV antenna, and then recording that video and storing it on some form of mass storage, most commonly a hard drive. The very basic function of this is similar to how VCRs used to work. Q: Are DVRs difficult to use? A: This mostly depends on the DVR in question. However, most recent DVRs are extremely simple to setup and use, with many of them featuring intuitive on-screen menus and guides that help you find and use the features offered by the device. Q: Is it legal to record shows from television on a DVR? A: This question has been hotly debated ever since the introduction of the first DVRs, with many broadcast television networks concerned about DVRs providing a way for people to watch shows while being able to easily skip commercials. Since advertising revenue has traditionally been the main source of revenue for any TV station or network, this was a legitimate cause for concern. However, in the present day, DVRs are perfectly legal to use to record broadcast television. Q: Is it legal to use DVRs to record video from non-broadcast television, such as from DVD or Blu-Ray players, or online streaming boxes? A: The terms for using a DVR to record video from other media sources has been a sticky issue. 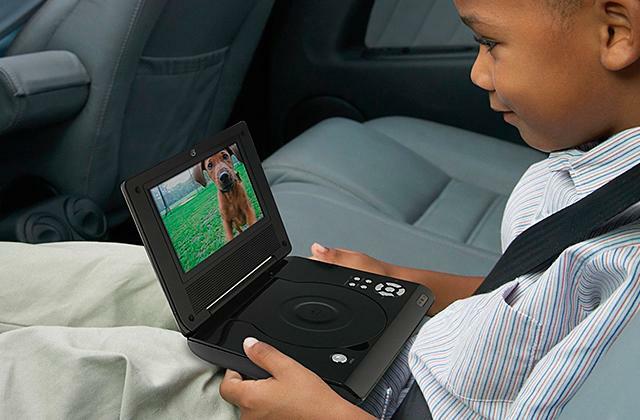 Many modern devices such as home media players include copy protection built-in, and the terms of service of their use often dictate that it is not legal to record video from their service. If you are using a DVR to record video from such services, it is best to keep this in mind. Q: Are there any legal prohibitions regarding video content that I record with a DVR? A: Legal prohibitions regarding recorded content can vary, depending on the content provider. In general, it is legal to record broadcast television, and there is also a legal gray area in regards to recording video content from other sources. However, in all cases, it is illegal to distribute copyrighted content that has been recorded for any purpose, including such actions as selling or giving away copies of such content. If you are unsure of the legality of your actions with a DVR, it is best to check with the provider of the content that you wish to record. Q: How can I edit the video content that I have recorded with my DVR? A: Some DVR models include features that allow for simple editing of recorded content, such as editing out commercials. However, for more full-featured editing, it is probably best to copy the content to a computer in order to edit with video editing software. Q: What are some best practices for scheduling television shows to be recorded? A: Many DVRs make it very simple to schedule recordings for television shows, with many making it a matter of simply selecting the show from a guide and pressing a button. However, some DVRs can have trouble with discerning a brand new episode of a television show from a rerun. If your DVR supports automatically checking for new episodes as opposed to reruns, you can simply select that option to make sure that you are recording the correct episode instead of one you have seen before. Another good practice is to schedule your recordings to start a short time before and to finish a short time after the scheduled start of a program. Not doing so many results in the very beginning or ending of a show to be cut off. 1. Digital Video Recorder, Wikipedia. 2. Adam Thursby Basic Digital Video Recorder (DVR) Features, Lifewire. March 2, 2017. 3. Benefits of DVR Players, Streetdirectory.com. 4. Carol Francois What is a PVR? wiseGEEK. April 4, 2018.